Warren Properties. We have established an enviable reputation for constructing houses of outstanding quality and excellence in the Newry City & District area. We employ a highly skilled and experienced team, combining complementary skills with a shared philosophy for building quality housing through quality of design. 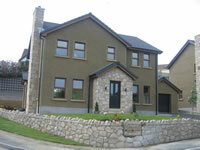 Our company is one of the leading builders of homes in the border region of Ireland. Our reputation is based on attention to detail and an insistence on the highest quality of construction. We benefit substantially from having an Intgrated Management System (IMS) which has been in place since 2007 and which incorporates the ISO 9001 (Quality Management); ISO 14001 (Environmental Management) & OHSAS 18001 (Health & Safety Managemene) standards. Copies of our certificates are available by clicking on the appropriate logo below.